1. Cook the penne in boiling salted water for 10 minutes, until just tender. Put the tomatoes, garlic, lemon zest, olives and capers in a large bowl and stir in the umami paste and olive oil. 2. Drain the pasta and refresh under cold running water. Stir into the tomato mixture to combine. 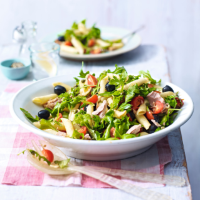 Gently fold the tuna and rocket through the pasta salad and check and adjust the seasoning. Serve straight away. For a vegetarian dish filled with umami flavours try Taste #5 Vegetarian Far Eastern Recipe Umami Paste stir fried with udon noodles and crunchy vegetables.